Brownlee Reservoir is located about 20 miles northwest of Cambridge, Idaho and is the uppermost reservoir of the Hells Canyon complex, which is a series of three Idaho Power dams built on the Snake River to generate electricity. Brownlee Reservoir is by far the largest, covering 15,000 acres and is 58 miles long. The reservoir is long and narrow, featuring rocky steep shorelines. Since the reservoir is the border between Oregon and Idaho, anglers with a license in either state can use facilities of either state to put in or take out boats, as long as they do not fish from the shore, dock or a docked boat in the state which they do not hold a license. 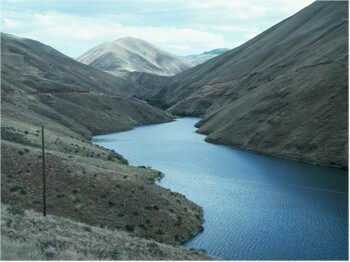 Brownlee Reservoir is among the most heavily fished waters in Idaho. Healthy populations of warm water fish such as smallmouth bass, catfish and crappie are especially popular. Brownlee has produced four state record gamefish; the flathead and bullhead catfish, and the white and black crappie. Perch, bluegill, largemouth bass and stocked rainbow add to the diversity of this fishery. Smallmouth bass is the premier fish of Brownlee. Best fishing is from a boat and there are few fish that are more fun to catch. Look for gravelbar areas and rocky outcroppings. Smallmouth are usually found in less than 20 feet of water, larger fish tend to be found deeper. Cast plugs, plastic grubs or worms, or lead-headed jigs and retrieve in a jigging motion. Largemouth bass can be caught with the same methods, but likely will be found in weedier shallows. They too should be actively fished with a jigging or retrieving action. Crappie fishing is best in the spring and early summer. Skirted lead-headed jigs, in a variety of colors are effective. Fish calm inlets by casting jigs toward shore and retrieving. Try various colors of jigs to see what is effective. Once you find them the action can be quick. Catfishing has become very popular in Brownlee, especially in the upper 1/3 of the reservoir. Best fishing is generally in the summer and can be done effectively from shore. Catfish are scavenger fish, so cubait, ripe chicken livers, or catfish stinkbait works best. Bait should be still fished off the bottom. You will want to use a medium weight rod with 10-12 lb. test line. These fish average 2-6 lbs., but much larger ones are not uncommon. Rainbow trout are stocked as fingerlings in Brownlee in spring and fall and grow in the reservoir to catchable size. They provide a good winter fishery near the dam. They can be caught trolling with rooster tails, spoons, or rapalas, or occasionally from shore by still fishing with worms. Bluegill are coming on in the lower 2/3 of the reservoir and are reaching good size. They can be caught on a variety of tackles and baits including lightly weighted hooks with worms, or jigs. Fly fishing with spider poppers can be great fun. Another popular summer fishery is for perch. They can be caught from boat or shore and once found, action can be fast. Most effective baits will be worms or cutbait.